Good summary of where things probably are. What are the odds the questions will leak? You may be right, but that may cause big problems as well. If multiple witnesses and/or written evidence say Trump did something and his only response is “I don’t recall” then he is basically surrendering a lot of ground he has to Mueller. Can Trump count on people willing and able to offer consistent accounts to back him up? The JDAs may help, but I wouldn’t assume someone like Don Jr, can pull it off. This is where we get into the pluperfect and the distinction between “what did you know then?” versus “what do you know now?” If people who’ve cooperated or testified under oath have contemporary accounts of King Idiot displaying knowledge at specific points in time, anything beyond do-not-recall has to line up. Plus, you know, he has the best memory. Another potential problem he may have is that keeping the conspiracy together may require him to actively back up the testimony others have already given. If Trump ghosts on someone too much, they may drop out of the conspiracy in order to protect themselves, something like Cohen did. IANAL, but “I don’t recall” is still perjury, even if it’s difficult to prove. With written answers, you have less of an excuse for not remembering on the spot, and if Mueller can show evidence that Trump does remember then he can bring perjury charges. With enough questions and outside evidence, Trump may not be able to avoid perjury (unless he actually answers honestly, of course). Isn’t Rudy a frequent guest on CNN, too? I’m just tempering the thought that they might have better sources than the Mike and Maggie show. Having said that, Trump has already set in motion the firing of Sessions. I suspect this effort will go into high gear in the beginning of November, right after elections. No one will hit the brakes in the GOP, as we know. I’m really worried that their efforts to stymie registration and votes, or just drop some in the trash afterward, might not give us the big blue wave. Now that they are stacking the courts, all the way up the Supremes (with a little help from Schumer on the lower ones), how effective will fighting in court be? I think, as you said, if this agreement is true, none of it will happen before they set the other wheels in motion. Trump is a liar, as are his spokespeople. Sorry, I’m just a bit less hopeful today that we will get to the bottom of the corruption. It is so deep and vast, I’m afraid it will swallow us whole. I hope I am very very wrong. Agree about the giant-mouthed whale that keeps spitting out more and more conflicting/corroborating info to sort, and the seemingly impossible task of making anything stick to Teflon Donald. Mueller is a master, or at least we need him to outdo himself to prosecute these crimes of the century. in texas today i woke up knowing that republican/evangelical control over young texans has created a mind set that nothing should be done in the way of change or your parents will hate you and you will go to hell. it starts in 6th grade and works its way up so that by the time they graduate they are so fearful of what others think and so bent under the dominion of church and parental approval that they dont know how to think. dont know how to ask a question. dont know how to say wait ! what did you say ? they just follow. so i dont really want them voting. their ignorance is a very real problem. their parents vote for cruz even when he takes away their health care and sends their children to die for reasons no one need explain fortunately for them. they think they will go to heaven and that life before that here on earth will be blessed if they vote for cruz. these are people who ruin my city. they own it. because if you put a beto sticker on your car it will be keyed or smashed. the police are for the most part unaffected by much of anything. they just want their dominance felt. you must feel it and cower or suffer the consequences. so trump can lie here. he can steal and he can allow journalists to be killed. he can call women liars and sneaks and they will love him all the more. the people here in my little city think manafort and gates are complicit with the investigation in the same way i think trump is complicit with the russians and the isrealis and any prince available. the courts are stacked against us now til the end of time. it doesnt matter what the truth is anymore. the truth will be underground myth here in my little texas city where teenagers have babies while smoking cigarettes. eating cheetos and drinking sugar. its what we do. they have never heard of manafort. That was depressing as hell, but rings true. And McConnell is the Cheney redux of ratfuckery and evilness. I’m beginning to wonder if Trump’s regime will end up being worse than HItler’s, with the support of so many authoritarian leaders internationally. This election will be v telling as to whether our democracy is completely in the garbage or not. All the voter suppression, the McConnell tactics, the brainwashing, trend towards authoritarianism y’all have mentioned – I’ll add Kavanuts – depressing. We just have to do everything we can through Nov 6th!! Thanks for the analysis, I wonder how long until the questions are answered and returned. The Bill Burck Politico link doesn’t seem to work for me. Yeah, here too, “page can not be found”. This is where “don’t ask a question where you don’t already know the answer” comes in. And Emmet Flood will know that for any questions that aren’t very tightly constructed around state of mind, Mueller will know what other actors believed King Idiot’s knowledge to be at the time. And Flood and the teevee lawyers will either have to “I do not recall” or construct something based on what they know from JDAs and their client’s unreliable narrative. Hmmm… I wonder if the “Trump Lawyers” think that now that Trump has his boys on the SC, he’ll be immune to any prosecution from perjury? Can Mueller’s team indict Trump anyway just to get the info out there, and let the Supremes argue over whether it’s constitutional or not? Honestly, no one believes that Trump as president is facing any criminal liability right now, but if evidence arises that he lied under penalty of perjury, wouldn’t that start the impeachment fight? Especially if it’s accompanied by several indictments in the case-in-chief conspiracy to emphasize the nature of the serious crimes he’s lying about? Something to keep in mind is that just because it is reported that they intend to provide written answers does not necessarily mean that they will provide written answers. I can very well imagine them stretching this out for months and then declaring that the questions are out of bounds according some arbitrary standard they invent and therefore refusing to comply. I’ll believe they are providing sworn testimony once they actually provide sworn testimony, and not until then. oops. most got left out. I meant to say, ‘providing written answers may not happen because in preparing written answers from t, will likely put his lawyers close to suborning perjury and they won’t have the excuse — as with testimony — for the lawyer to say i didn’t know that that was what my client would testify. he is still a republican and i am sorry but that usually means something. in this case he has deferred to the presidency even though trumps position was illegally obtained. ownership is 99 percent legal. even when stolen. i dont trust him to go all the way. i dont trust him to fight openly so that we the people know anything at all. i am not sure he thinks i should know. i do know that he is a republican for reasons he has justified to himself. and that means something to me. No, Mueller will not “throw” this investigation or subsequent prosecution(s) and the question of whether or not Trumpty Dumpster can be indicted while in office is a distraction. If he is to be removed from office before 2020 it will hafta be through impeachment. The Mueller investigation must continue until the Dumpster decides to purge the Justice Department, at that time I’m certain that Mueller has a dead man switch constructed that includes making the report to Congress. We can’t waste time speculating about “what ifs” and to worry about Mueller droppin’ the ball on this because he is a Republican is silly to be charitable. I don’t think this has much to do with any possible trial (yeah, they might catch Trump lying, but so what? We already know that he lies frequently.) I think this has to do with the timing of the election and its aftermath and with manipulating Trump’s state of mind. 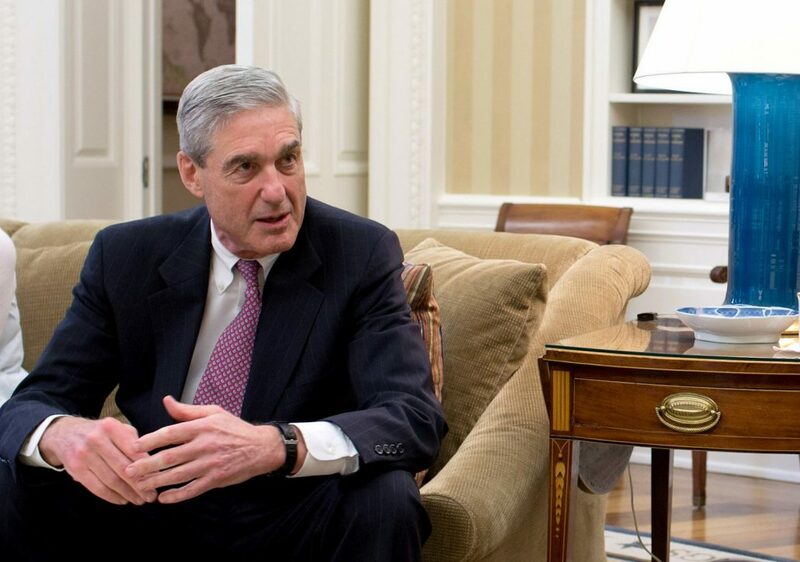 I think Mueller & Co. want Trump to finish his take-home test right around November 1st, and for everyone around Trump to say, “Great job boss, you wrote just the right things!” because Trump does need to be manipulated and soothed, and now Trump is calm and happy about Mueller immediately after election day because everyone told him he did great and has solved the problem. Ty for keeping us informed. I hope they nail the mf to the wall along with some of his spawn, minions, and gop enablers! Ditto, it may be a Herculean task at this point but I have the hope! “…they might catch Trump lying, but so what?” Sounds a lot less flip to me after the last Kavanaugh hearing. The decline in respect for institutions and norms has fallen off so much since Watergate – even lip service seems to have disappeared. Trump first offered an interview in June 2017. I don’t know when Mueller entered negotiations for real, but it would seem >1 year’s negotiations would be accurate. He’s been stalling for time, perhaps effectively, perhaps not. i know in my head it is silly to think that mueller is a party man first. i am good with you saying so because i want that to be true. but what i meant is that republicans by and large have this affinity with office itself and by proxy the office holder himself.so that on occasion he may hold back in a show of respect for the office. not the office holder… to not hold accountable someone who cannot be proved beyond a shadow of a hint of a mouses doubt. thats all. he has gone after political operators like a firestorm. and that makes me trust him. but no one in office. and that worries me. No one in office yet, the structure of the conspiracy involves non-office holders and they are those most vulnerable to criminal investigation and charges. The elected officials who were involved or received benefit from the conspiracy can be ferreted out and prosecuted when the conspiracy itself is unwound in court and/or in Congress. There is much to worry about between now and then outside the investigation that we mustn’t take our eyes off and that we can have some impact on like the upcoming election. Conserve your emotional energy, this is a looooong way from over. its different when one is in a state so horrendously under the thumb of republican control. i cant remember the last time my vote meant anything. that my concerns voiced to my representatives in either congress or the state house meant anything. for my complaints about the science teacher in my daughters high school who announced that evolution was something she was forced to teach but that she would only briefly cover it and indeed she covered it so poorly that no child understood it. my daughter brought her friends home in groups to have science explained on a weekly basis. even reproduction. the failure has been so disruptive and purposeful that faith in due process feels flighty. i see cruz’ numbers rise and so i hope for the unobtainable as i try to de program one more 23 year old today that my daughter is bringing by for coffee today. she used to bring me the homeless ones. this is somehow more lingering. Looks like you’ve got an intellectual freedom train running. Thanks to you and your daughter from those of us in more palatable political environments. Hey, Allison, don’t let it keep you from voting, though! And get any of your friends out, too. We have to keep fighting this fight. It sounds like really a lot that you are up against, but don’t give up. I keep feeling that the Beto polls are lower than Cruz’s b/c they are barking up the wrong tree in whom they are calling. If you look at beto’s twitter feed he is going to multiple stadiums and auditoriums and other venues per day to get his message out. As much as there is darkness in TX, I think he is galvanizing the light. I’m not there and I can’t say, but it seems like an awful lot of energy is behind him, that will translate into something real on election day. You didn’t mention Nader’s testimony regarding back channel meetings (Seychelles). Is that gravy? In that bullet list of questions, the phrase “during the campaign” comes up rather regularly. If I were crafting the questions, I’d want to be much more specific. “During the campaign” can be narrowly construed to mean between Trump’s descent on the golden stairs on June 16, 2015 and the election date of November 8, 2016. I could see places where Mueller would want to include the transition period in those questions, as well as times when he’d want more information that predates the formal announcement of Trump’s candidacy. I think you may be right. Two thoughts. 1. The introduction to the questions probably contains definitions and instructions. They may cover the issues you raise. For example, “the campaign” may be a term defined by dates. Or, the instructions may require dating. 2. It may be that a bit of imprecision can open the door to gaining more information. A careful answer would include dates. A careless answer may open the door to further questions. It’s worth remembering that those questions were written by Trump’s lawyers. They had spoken to Mueller’s team to try to get clarity on the things they were interested in asking Trump, and then wrote up those questions for a review session with Trump. In classic NY Times fashion, the questions were later leaked by Trump’s lawyers, and the access reporters layered on the spin that these were Mueller’s questions, rather than guesses by Trump’s attorneys about what Mueller might ask. That’s not say they are totally fiction, but they are heavily filtered, and have been used by both Trump’s team and the NY Times chuckleheads to advance the idea that Mueller had been mostly focused on obstruction. could this administration create a national crisis to interfere with the completion of this process? what kind of crisis might that be? is that something Mueller and/or congress would have factored?in? I can’t see Trump going along with the usual Republican “I don’t recall” hedge. Even if his lawyers get those words on paper, it runs counter to his “great brain” delusion. He’ll run to his Faux Friends and promptly perjure himself in front of the nation. His attorneys will subsequently have to leave the country to gain employment where they are better respected – like Saudi Arabia. I look forward to what the OSC brings forward on Oct 19th… I’m curious if we will learn if Manafort is still in that damned JDA, as reported by Politico as per Ghouliani (link below), and whether he’s tried to lie to Mueller about Trump’s knowledge of TT meeting. OT – Marcy, I saw on your Twitter feed a comment about Kamala Harris raising $ for other candidates – the one for McCaskill splits the contribution b/t McCaskill and Harris! I like Kamala a lot but this is the antithesis of transparent fundraising. Avenatti did the same in “raising money for Beto” with his Fight PAC (Beto doesn’t take PAC $ anyway). You have to be really careful to read where the $$ is going to these days, it’s not always clear from the jump. Last note – all the voter suppression news, and all the Brian Kemp news, is depressing!! Kemp and the Republican state legislature whose interests he represents. The race-based voting discrimination is blatant, thanks, in part, to the Supreme Court. In a controversial 5-4 decision – the type that is now likely to become the norm – it gutted the heart of the VRA, in a move that amounted to an invitation to ramp up discrimination. Can someone explain what Flood’s title is if he only remains for the SC investigation? Are there now two WH counsels, and is that common? There’s one White House Counsel. S/he runs a department with multiple staff.